Growing a beard can be problematic for many men. They simply can’t grow facial hair without experiencing itchiness beyond control or a beard never grows robust or long enough. Premium quality beard oil can help in eliminating beard itchiness that occurs in the first stages of beard growth and in combination with a beard growth serum it will help you grow that beard you’ve been dreaming of. 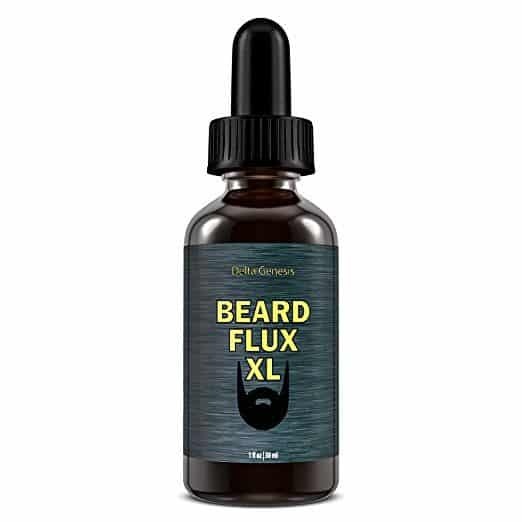 The ingredients in this product will help you jump-start the beard growth, even if you are in your 40’s or 50’s and have never grown a beard before or you are just growing your first facial hairs. We will discuss how the beard growth serum can help you with beard growth, how to use the product properly, and which are the best ones on the market today. 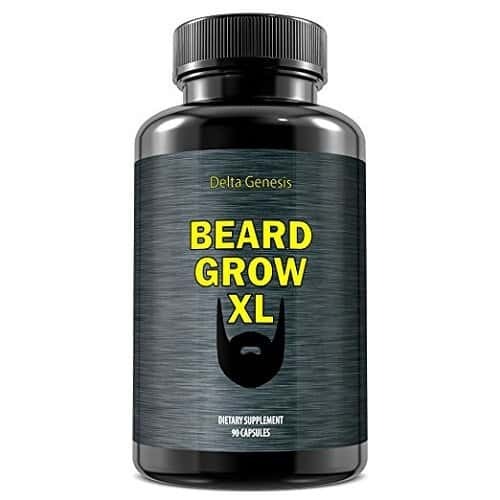 Whether your beard is thin or you’re not getting that thick facial hair of your dreams, Beard Grow XL | Facial Hair Supplement might be the right solution for you. This beard supplement has shown excellent results in dealing with patchy beard, sparse mustache and slow facial hair growth. Some would argue that the reason behind this lays in its enhanced formula that supports natural facial hair’s growth. The package contains supply that will last you for 30 days, and during that time you will start to notice that your beard is much denser, healthier, manlier and better looking. Now, when speaking about facial hair supplements, many people worry about the possible side effects because most of them have hormones. Not this one. You can be sure that it is entirely hormone-free, so you won’t have anything to worry. Results will manifest very fast, and you will soon notice that your beard grows faster and thicker than it normally does. All the ingredients are high-quality, and they will enhance your beard’s growth from the inside out. 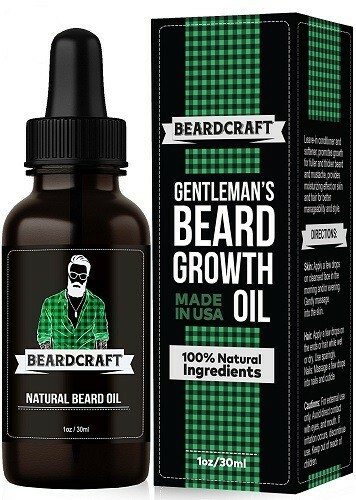 For men looking for a product that is a beard softener, conditioner (check why is Honest Amish a bestseller), and a moisturizer all in one, Beardcraft Unscented Beard Growth Oil might be the right thing. As its name suggests, it’s completely unscented, fragrance-free beard growth oil. Your beard will absorb it quickly, and you will never have to deal with any residue. 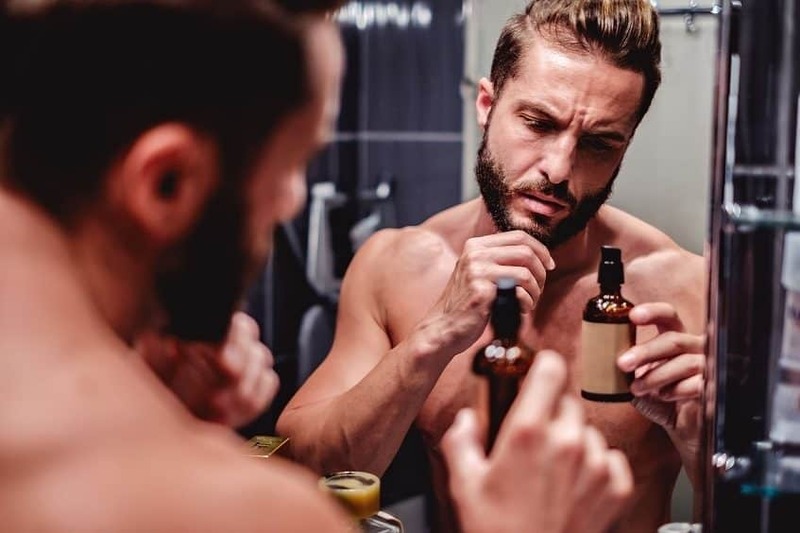 If your beard is already thick and full enough, but you still want to use a fragrance-free beard oil, go for Ranger Grooming Co. Unscented Oil, known for its numerous benefits that has on beard and skin. Another good news is that it’s 100% organic and appropriate for all skin types. That’s right, even for the sensitive skin. Its benefits are numerous. It is known to stop itchiness, flaking and any skin irritation, while also promoting softer and more manageable facial hair. Of course, this product also fulfills its primary purpose – it promotes beard growth and makes your facial hair appear fuller and thicker. As a bonus, you can use it not only on your beard but also on your skin, hair, and nails. A few drops, gently massaged into the cleansed face in the morning and evening will do wonders in soothing dry skin. For your hair just apply a few drops on the ends, and make sure to use it sparingly. To use it on your nails just massage it on your cuticle and nail. The manufacturer claims that there are up to 5% chances that you won’t respond to the formula, in which cases you will get a full refund. Every man wants a fuller, thicker and manlier beard that is also healthy, vibrant, smooth and soft. With so many criteria, it can be hard to find the one product that will do all this. 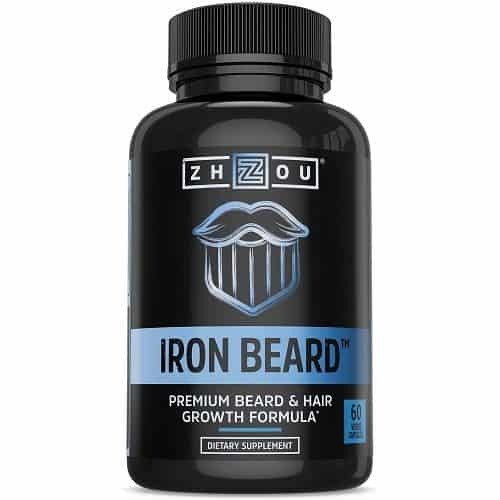 However, people that made IRON BEARD Beard Growth Vitamin Supplement had this in mind, so they included 18 essential proteins, minerals, and vitamins when making this product. One of the key ingredients is Biotin, known as the hair growth vitamin that is proven to nourish and boost new beard growth while making the existing hairs stronger. To ensure maximum results, there is also herbal support (pumpkin seed, nettle extracts, and the Chinese herbal fo-ti or shou wu) included in the product. These nutrients will make your beard look lush, fuller and add volume to it, while your hair, skin, and nails will also benefit. It’s suitable for all skin and beard types. 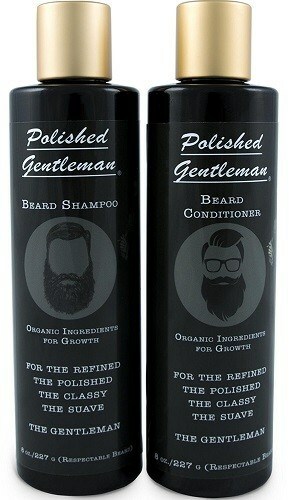 This product from Polished Gentlemen is actually two products – shampoo and conditioner. Both of them are made with high-quality, natural ingredients. The list of ingredients includes tea tree, rosemary, Biotin, aloe, argan and peppermint oil, manuka honey and eucalyptus. The powerful formula increases your beard’s growth and makes it look thicker. Shampoo and conditioner you get in the set are great it making your beard softer, and keeping your skin underneath smooth. Once applied, this product leaves your beard relaxed, laying better and more manageable. If you had problems with knots and tangles in your facial hair, you won’t have to deal with them anymore. You will notice that it lathers and rinses out pretty well, and a little can go a long way. Harsh chemicals used in beard growth serums and other beard growth products are often the reason why men tend to avoid them. Lipogaine Hair Growth Stimulating All Natural Shampoo is completely different. It is made with all the ingredients that are known to cause a beard thicker and fuller on a natural basis. They are very mild and include Biotin, caffeine, argan and castor oil, all of which are known as powerful facial hair growth boosters. Lipogaine is considered the top-rated beard serum on the market for good reason. It is FDA approved and it gets results. It is more costly than other beard serums though. This serum will provide your hair follicles all the nutrients it needs to grow healthy and thick. Also, it will strengthen and nourish the existing hairs and prevent thinning and breakage. The fast acting formula of Beard Flux Caffeine Beard Growth Oil improves and encourages healthy facial hair growth. With a blend of top essential oils and infused with caffeine, this product is highly effective in stimulating beard growth and volume. Purely organic and natural ingredients, such as argan and jojoba oil are the base and there are no any fillers, fragrances, parabens or GMOs included. Jojoba oil is also great when used on its own as it reduces the appearance of beard dandruff and moisturizes the skin beneath the beard. As you can guess, having no fragrances added makes this oil completely unscented. The product itself soaks into the beard very fast and is pretty easy to apply. Besides helping your facial hair sprout faster, the oil is also effective in dealing with a scruffy, patchy or itchy beard. 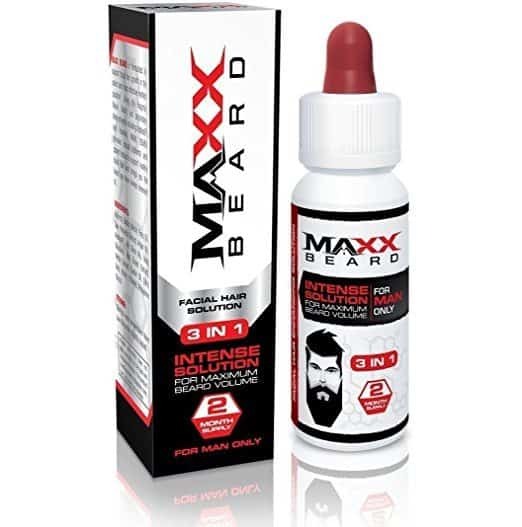 If you are not satisfied with your facial hair’s length, volume and thickness, Maxx Beard is a great natural solution that supports and boosts beard growth. The primary ingredient is kopyrrol that works the similar way as Minoxidil but doesn’t have its downsides. Other components are Niacin, Biotin and blend of natural herbs. 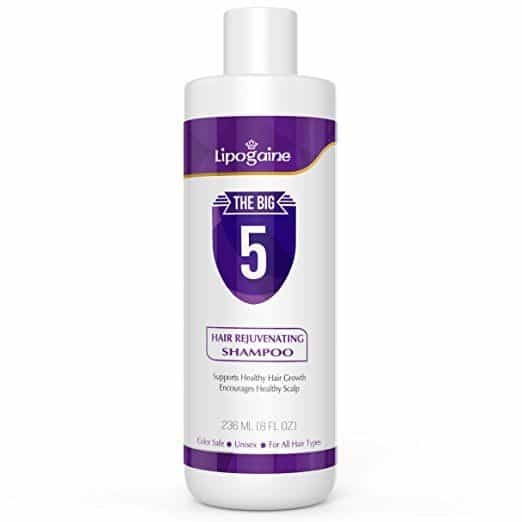 Just one daily application is enough for the lasting effects during the whole day and with that kind of use, it will last you for at least 2 months. The beard will absorb the product fairly quickly, without drying out or irritating your skin. Don’t expect this serum to be a magic pill that will make your beard grow out of the blue, because it doesn’t exist that type of product. Instead, it will work like a charm in helping you fill in bald spots and making your facial hair appear thicker and fuller. , beard growth serum penetrates deep into the hair follicles on your face and forces them to begin growing. The hair on your face is different than on your head, so the serum needs to work in activating each follicle separately for maximum growth potential. The end result is a beard that grows longer, thicker, and stronger. By applying a serum to the face each day, your hair follicles will sprout and you will notice an improved growth quickly. The primary ingredient in most beard growth serums is Minoxidil, and it works by increasing the blood flow to the capillaries in the follicles. Once the follicles receive the nutrients they need, the hairs grow longer, stronger, and lustrous. The beard serum will dissolve away any sebum build-up that is clogging your pores and keeping the hair from sprouting. Most men see incredible results after a few weeks of starting their new routine. In order to achieve the maximum beard growth, it is important that you apply the product correctly or you will be wasting your time and money. Before applying any serum to the face, it is especially important that you wash the facial area thoroughly or you will not attain the desired result. Washing the skin and then pat drying with a clean towel is preferred and gives you the perfect foundation for starting the beard growing process. Take your bottle of beard growth serum and shake it good to ensure that all the ingredients mix properly. Massage the serum in circular motions into the face area where you would like to see hair growth. Continue doing so until you get a nice and even coverage. If you are growing your first beard or have patches in some areas, make sure to cover those spots completely. Once you have massaged the serum into the skin, leave it for 10 minutes until it properly dries. Try not to touch or do anything in those areas during the drying time. This is a very important point in the process, so be sure to allow the allotted drying time. After 10 minutes have passed, it is time to rinse off the solution. Using tepid water, apply your normal face cleanser and start to wash off every trace of the serum. Take your time and gently clean the surface of the face and neck until you are confident that any serum residue is gone. Depending on the brand of serum, you can apply it a second time later in the day and simply repeat this process again. Applying the product the morning and again before bed will ensure maximum effectiveness. Photo from: Sasa Mihajlovic © 123RF.com. Didn’t know about it.Been using it for 6 days now and I’m very happy . Obviously it’s not a 6 day thing but my my beard is growing a lot stronger and quicker then it normally does after a shave I highly recommend beard serum great stuff .